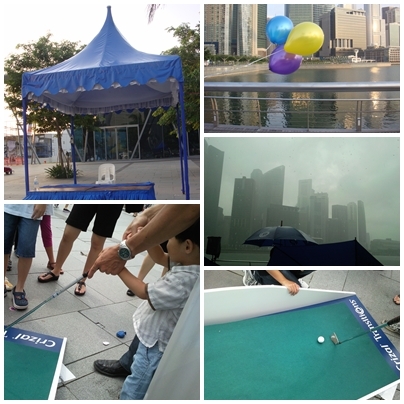 The event was held at Waterfront Promenade, beside MBS. Spent a whole day packing goodie bags, giving balloons to kids, educating the public about transition lens, giving out goodie bags, tending the games station,attracting kids to take polaroid photos with our mascot! Was a super tiring day. Had been standing for almost the whole day from 7.30am-6pm! That place was rather nicely decorated with lots of balloons! Though at the end of the event most of the balloons that were tied there as decoration were gone and people just untied them and took it away. 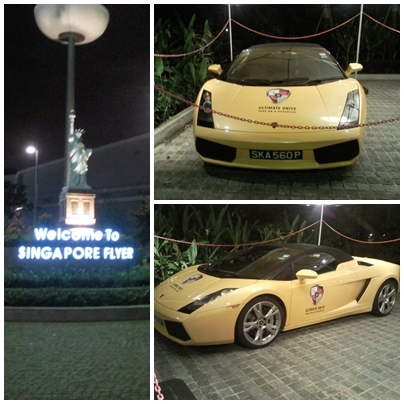 The photo with the balloon is what I took when I reached there at 7.30am! Each booth had a 3m x 3m gazebo (the blue one in the photo). Ours was yellow in colour :) The bad thing that happened during the event was that there was a heavy downpour at around 11+am! But other than that it was quite fun there. Especially seeing the cute kids play our mini golf game there! While it was raining heavily, we went for our quick lunch! 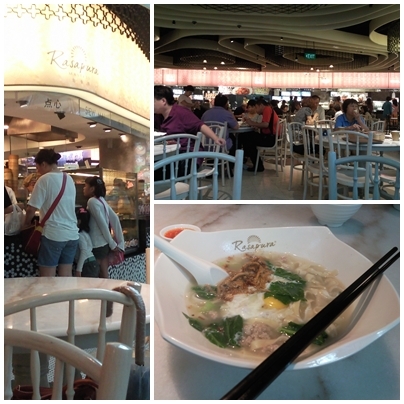 We were only given 30mins for lunch :( So we had no choice but to go to Marina Bay Sands Food Court to eat. And... The food there was super ex! And it taste just like the normal food court food! The ban mian I bought costs $6.20! By the time the event ended and after we packed up! The NDP rehearsal started! The colour of the sky then was really nice!! Also there were alot of people at the helix bridge! Guess they were there to watch the parade or were waiting for the fireworks later at about 8+pm? 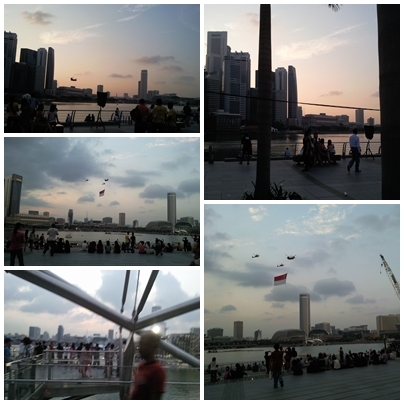 There was alot of people seated down outside MBS to watch the parade too! And guess what? 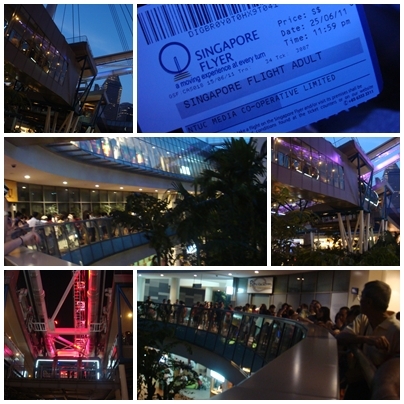 WE HAD FREE TICKETS TO SINGAPORE FLYER! Think it was given by NTUC? As that's what's written on the ticket :) Cause while we were giving out excess goodie bags at the end of the event, one person approached one of our friends and gave her 7 Singapore Flyer tickets! But it was only valid for that day. So we went there straight after work. But there queue there was horrible! See the long queue in the photos above? 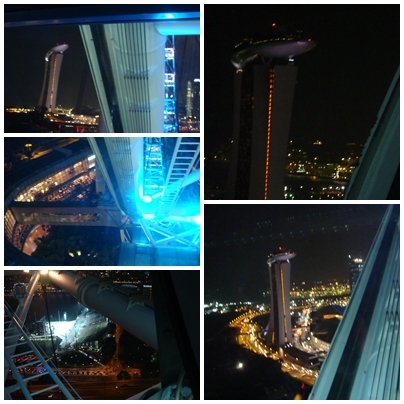 For those who went to Singapore Flyer before would know that the building is somewhat circular. And the queue which started from the point of entrance almost formed a full circle! Though the queue keeps moving as people enter, the number of people coming is never ending! We waited for more than an hour before boarding! After you scanned your pass to enter the pre-flight gallery there was a security screening just like those in the airport! The pre-flight gallery is the path you must walk before you can reach the cabins - the horrible thing is this gallery is somewhat like a maze and it was full of people queuing! Along the Pre-Flight Gallery. There is also a stop for you to take photos! But you can choose not to take if you are worried that you might be tempted to buy the photo :) That was what we did. We just walked through and said we will give the photo taking a miss. And finally! After waiting for so long with our aching feets! We are near the entrance of the cabin!! 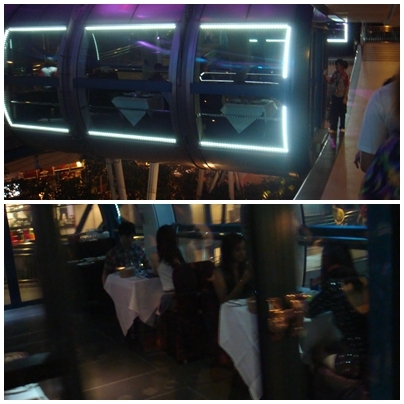 Here's a photo of the Sky Dining cabin. Looks quite nice. But 4 couples inside and it seems a little squeezy and awkward. Moving up! It's better to sit on the right side of the cabin. 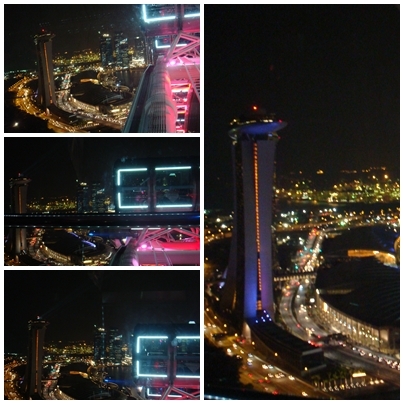 Then you will have a good view of MBS. The other side can only see Singapore Pit Building and stuff. Not really nice view. 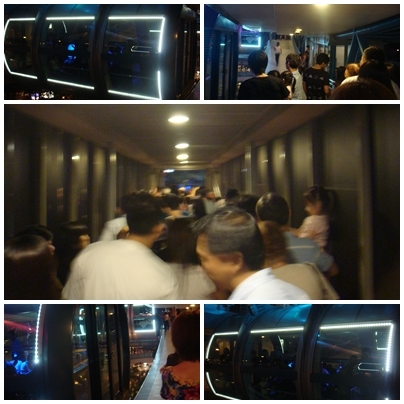 Actually it's better to take the Singapore Flyer at evening time. It's easier to take photo and the scenery would be nice too (nice colour of the sky!). Cause the cabin is too dark to take photos without flash. And if you take with flash, you can hardly see the background too as the glass would reflect. 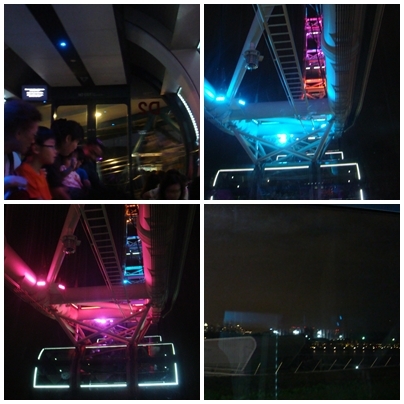 When we are close to being at the highest point of Singapore Flyer! 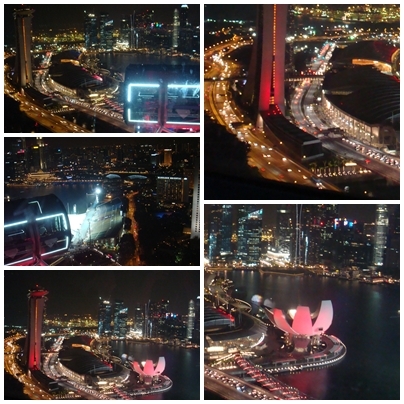 At the highest point of Singapore Flyer!! The flyer ride was so-so only. I had wanted to take more photos but were unable to as it was too dark with flash and it isn't nice with flash :( Oh wells. 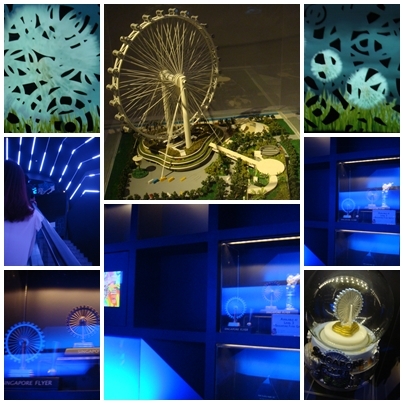 But its an experience on Singapore Flyer! But it's scary when boarding and alighting the cabin! They won't stop the cabin and wait for you to walk out or enter. It will just keep moving! So be careful with your steps if you are boarding/alighting!